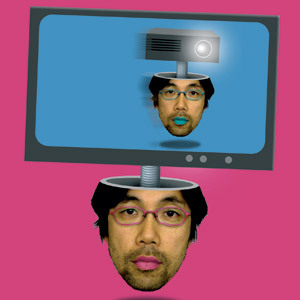 Mamoru Iriguchi is a zoologist, theatre designer (Best Design, Evening Standard Theatre Awards) and multimedia performance maker (commissions including the Place Prize and Plateaux Festival, Mousonturm). He is an Artsadmin Associate Artist 2012/13. "Projector/Conjector is a love story ... but not like any other...Through images and words they reveal/project, ... a bonkers story emerges...It's a kind of sci-fi Swan Lake tragi-comedy, and as well as being absurdly hilarious, it's also very sweet." "...dance is referenced in a beautifully techno-cuckoo way. It's a piece about outer space and inner desires, tragic love and a literally bloody lake of swans, It's also charmingly dead-pan, witty and inventive."